Did House Democrats Vote Against Shutdown Back Pay in January 2019? - Truth or Fiction? Did House Democrats Vote Against Shutdown Back Pay in January 2019? A Republican Congressman said Democrats voted against issuing paychecks to furloughed workers, but the muddied reality pointed to procedural partisan bickering. Congressional Democrats voted against giving government workers shutdown backpay on January 17 2019. 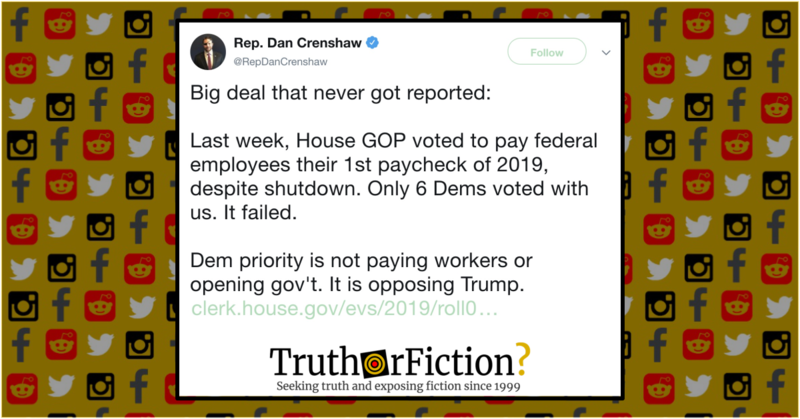 Rep. Crenshaw linked to a roll call vote for January 17 2019, for “final vote results for roll call 43.” As he stated, the tally of “yeas” for Republicans was 189, for Democrats, 6. No “nays” appeared in the Republican column, while there were 222 votes counted for Democrats. Overall, the tally in total was 195 “yeas” and 222 “nays.” On first glance, Crenshaw’s link appeared to support his claim. Roll Call 43 was attached to “H.J. Res. 28.” We located a page on Congress.gov, “H.J.Res.28 – Further Additional Continuing Appropriations Act, 2019.” That resolution was sponsored by Rep. Nita Lowey (D-New York) and a section of the bill (“All Actions“) broke down its movements through January 23 2019. VITIATION OF EARLIER PROCEEDINGS – [Rep. Steny] Hoyer [D-MD] asked unanimous consent to vacate proceedings by which House Joint Resolution 28 was passed, and the motion to reconsider laid upon the table, to the end that the Chair put the question on passage of House Joint Resolution 28 de novo, and further that if a recorded vote or the yeas and nays are ordered on the question of passage of House Joint Resolution 28, further proceedings may be postponed through the legislative day of January 23, 2019, as though under clause 8 of rule 20. Agreed to without objection. That roll call vote (here), “on passage,” recorded 223 “yeas” and one “nay” from Democrats, and six “yeas” and 183 “nays” from Republicans. Both roll call votes were starkly divided along party lines, the former vote on the Motion to Recommit favored by Republicans and the latter vote on passage by Democrats. The Administration opposes H.J. Res. 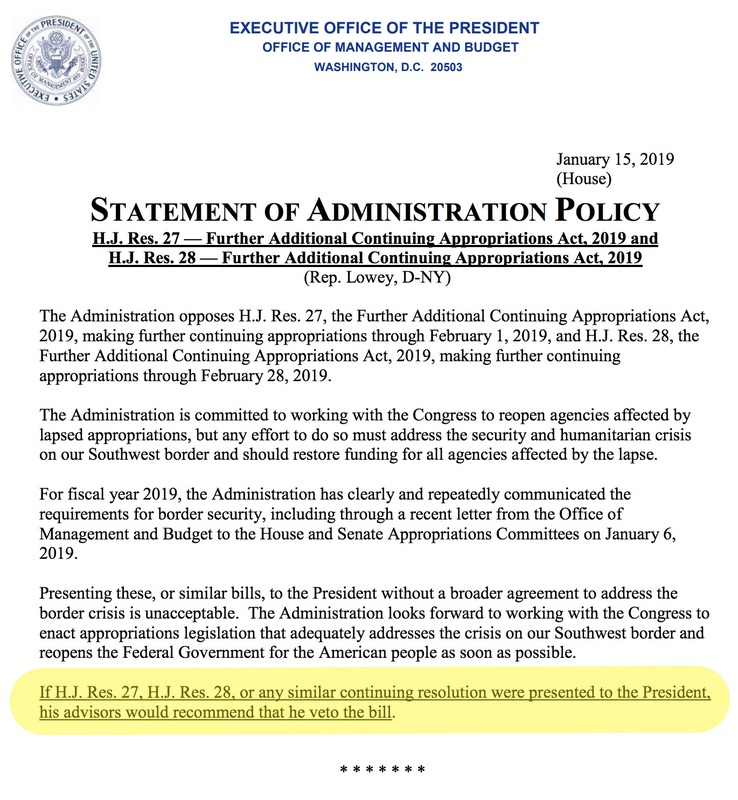 27, the Further Additional Continuing Appropriations Act, 2019, making further continuing appropriations through February 1, 2019, and H.J. Res. 28, the Further Additional Continuing Appropriations Act, 2019, making further continuing appropriations through February 28, 2019. If H.J. Res. 27, H.J. Res. 28, or any similar continuing resolution were presented to the President, his advisors would recommend that he veto the bill. It seemed simple: The House on [January 17 2019] passed a continuing resolution that would reopen nine Cabinet departments through Feb. 28  on a voice vote, a result that devolved into partisan sparring on the floor as Republicans sought to vacate the vote and Democrats said, in effect, too bad. By the end, both sides hugged it out, vacated the initial vote, voted by voice again, and postponed a roll call vote until [January 23 2019]. 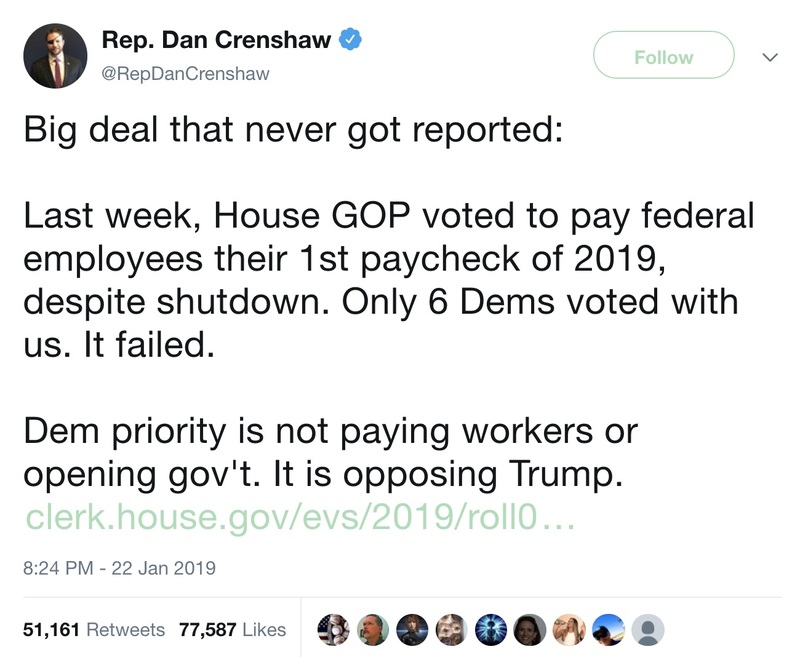 Rep. Crenshaw’s tweet intimated that House Republicans voted to issue a single paycheck to furloughed workers, while House Democrats voted against the measure. Based on accounts of events in the chamber on the day of the vote, even present Congressmen and women were unclear on the events that occurred. The vote linked by Crenshaw was a Motion to Recommit, which was voted down largely by Democrats and up largely by Republicans. A subsequent vote on passage occurred on January 23 2019, and it was favored by Democrats, while Republicans mostly voted against it. Does This Photograph Show the 2019 ‘March for Life’? Did a Preacher Say Alexandria Ocasio-Cortez Was ‘Summoning Demons’ by Dancing?